Wall switch operation means the lamp can be switched off and on with a traditional light switch, while Occupancy Mode introduces the fixture’s motion sensor, indicated by a green LED light while in operation and able to detect motion for up to 20 feet away. Once motion is no longer detected, the luminaire operates an additional three minutes before automatically switching off. The fixture’s third setting is triggered using a standard on-off switch located on the device itself. Earlier in 2018, EPCO also added a new LED utility luminaire to its line of ProSeries lighting products. Its ProSeries “Elite” line features weather-resistant IP65 rated LED utility luminaires available in ceiling/pendant or wall mount configurations that produce 79 lumens per watt, boast 93 percent electrical efficiency, and are suitable for a variety of indoor and outdoor lighting applications. Anderson called the new lamps “virtually maintenance free” pointing out that LED light engine design has allowed the development of smaller, lightweight and more compact bulbs that can now be put in locations where larger LED lamps would not fit. 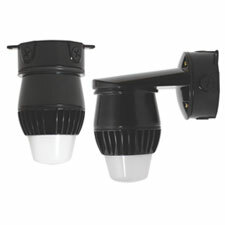 Additional features of the new LED fixtures, EPCO said, include: LED optics that magnify lumen output and produce minimal glare; a UV-resistant, precision molded polycarbonate diffuser that is 100 percent impact resistant; solid core pre-shrunk silicone gaskets that provide a water tight seal against the ingress dirt and moisture; and durable die-cast aluminum heat sink housing, finished in a black "E" coat material guaranteed to not rust or corrode. EPCO suggests LEDs can reduce energy consumption by up to 75 percent over other lighting fixtures. All the new LED fixtures are IP65 rating for use in damp or wet locations, and carry an industry standard five (5) year or 50,000 hour warranty.